One of the first things you probably think of doing after getting your web site up and running is to get your web pages indexed into major Search Engines such as Google and Yahoo! 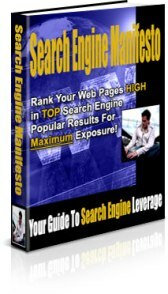 But what is often omitted is that everyone – including your competitors – are being motivated by the same maxim to achieve top 10, if not first, position in the Search Engine results… and the worst case scenario can be none other than thousands of competitors competing in the same niche market as you are! This PDF ebook also comes with Private Label Rights!